After six decades of serving time-tested favorites that folks seem to enjoy and occasionally screwing about with new french fries, Burger King has decided it’s time to experiment with Tex-Mex for some godawful reason. So they put most of a Whopper in a soft tortilla. Sure. It’s not quite a traditional fast food burrito, not quite just a Whopper crumpled up and rolled up. While most of the traditional elements of the Whopper are present—pickles, tomatoes, onions, burger meat, lettuce—the mayo has been replaced with a pepper cheese sauce (which isn’t all that peppery), and some places serve it with taco sauce, while others leave it off. Also, unlike the traditional Whopper, it’s not good. This post originally appeared 8/24/16. I’ve had two Whopperritos since they launched earlier this month. The first contained dry, bland meat, severely wilted lettuce, all the pickles they had in the restaurant and the odd tomato. It was the worst thing I’ve had wrapped in a tortilla. The meat, not particularly flavorful in disc form, loses all but its texture when crumpled into bits. The only thing worse than letting lettuce sit atop a hot sandwich too long is trapping it inside a tortilla wrapper with its killer. That’s two flavors down, leaving us with eh cheese sauce, pickles, onions and sadness. I pledged not to make a video, but snackology is dictated by the people, not the snackologist, so I gave the Whopperrito one more try. WARNING: The video that follows features the merciless dissection of a food product. This time around the Whopperrito featured taco sauce, which is listed as one of the ingredients on the Burger King website, despite myself and many others (like SnackTAYku) getting it served without. So this Whopperrito had a taste, and that taste was oily taco sauce and pickles. We’re about to deep dive inside the Whopperrito. The weak of stomach may want to turn away. In the span of the 10 minute drive home from the Burger King, the lettuce inside the Whopperrito has been murdered, its cell structure weakened by heat and pressure. It’s a shadow of itself, a wilted plant corpse torn to pieces and left to rot in a sea of meat. The hearty tomato valiantly struggles to retain some sense of self, but it’s clear that cheese sauce is a brick and it’s drowning slowly. 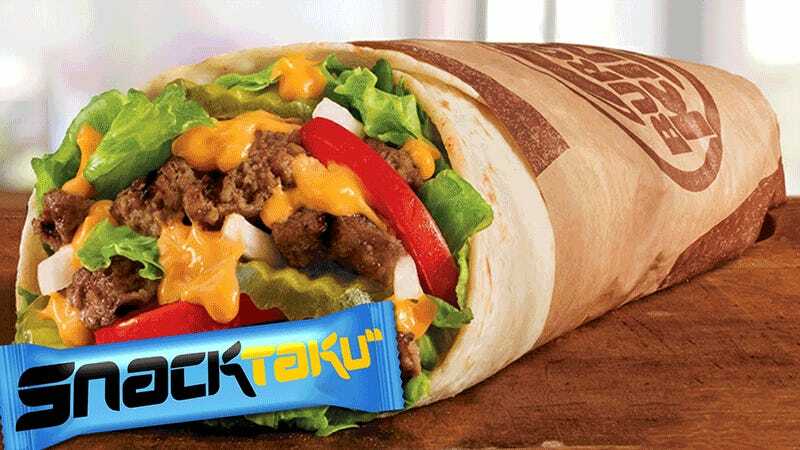 While taco sauce was included within this Whopperrito, which adds spice and a little heat, but it does absolutely nothing to enhance the beef, obviously a crumbled standard burger patty. Its primary contribution to the wrap is wetness. Or maybe they really do get it. The Whopperrito isn’t about good food. It’s about turning heads and getting bodies into restaurants. Burger King wants folks talking, and if it has to sacrifice its dignity to do it, then so be it. Snacktaku is Kotaku’s take on the wild and wonderful world of eating (and drinking) things, but not eating meals. Eating meals is for those with too much time on their hands.